With the Rapsatodits, the nearest pancit batil patong experience in Quezon City closing down, we were kinda hard-pressed where to get our northern noodle fix when the craving attacks without going all the way to Paco’s Jibs and Bustillos’ Cagayan’s Best. As luck would have it, one of my common friends in Facebook tagged me on their batil patong find that’s just a ride away from Trinoma, Weng’s Pancit Batil Patung. 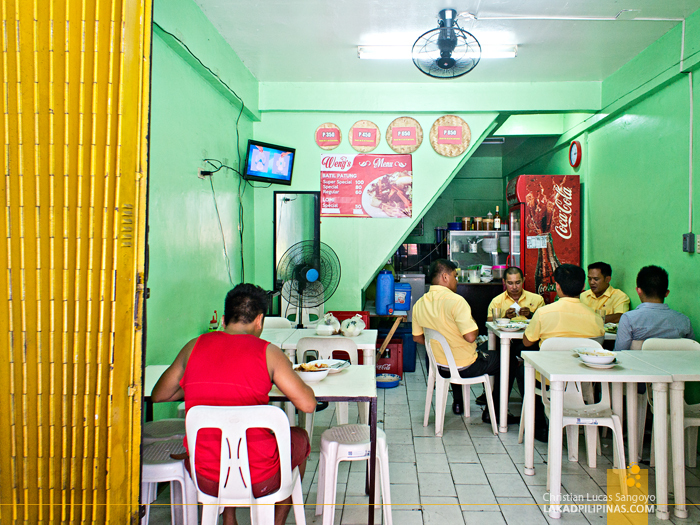 Located on Del Monte Avenue, just a few steps away from West Avenue, Weng’s place is an unassuming open-aired panciteria. 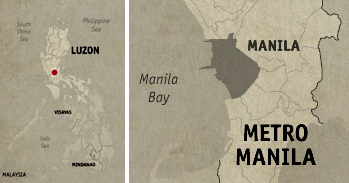 A shocking red tarpaulin announces that they do serve Cagayan Valley’s famous pancit. 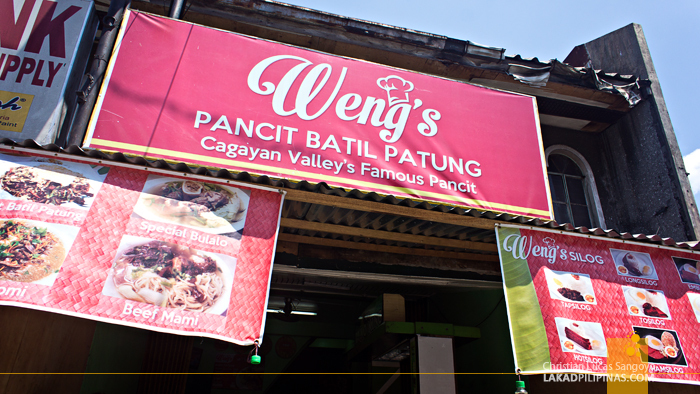 There were a few patrons having lunch at Weng’s during our first visit, they do serve the usual silog meals and even Cagayan’s special bulalo. Before ordering, I asked the server if they get policemen visiting the eatery. I got a resounding yes. That only means one thing, this place is legit; there’s quite a number of law enforcers that hail from Cagayan Valley, and if they frequent this place, that means their noodles is quite worthy. 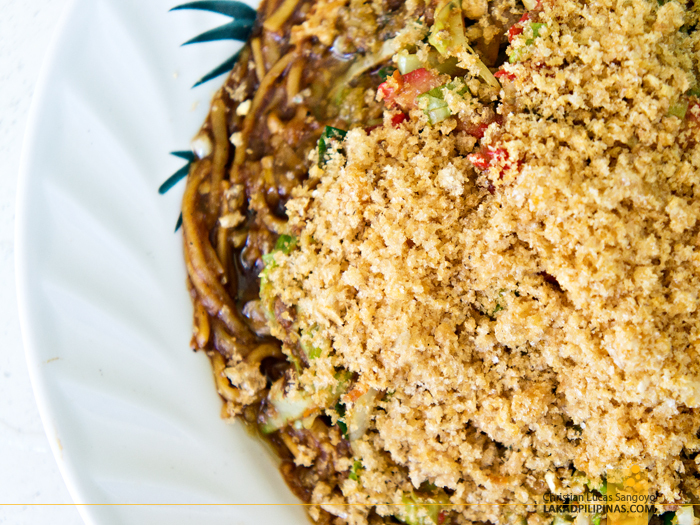 Weng’s pancit batil patung (as Cagayanos spell it) are served in three sizes, Regular (Php60.00), Special—which comes with chicharon (Php80.00) and Super Special—with chicharon and hotdogs (Php100.00). These, of course, have the usual egg drop soup (batil) and chopped onion sidings. 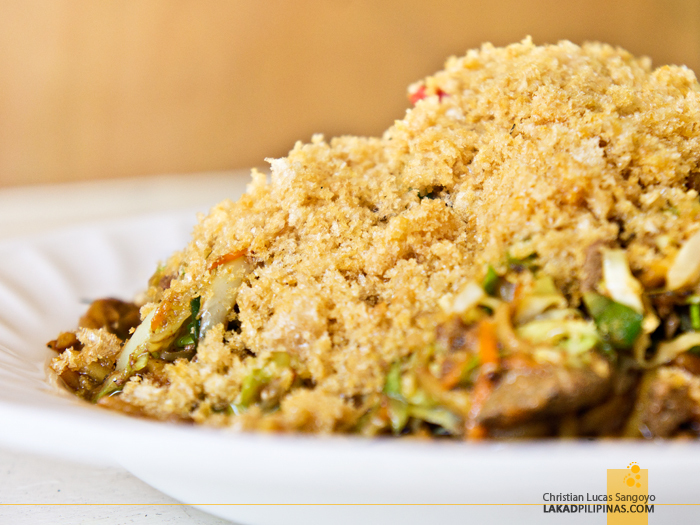 Together with my usual pancit buddy, we asked for their Super Special, which we plan on sharing. I find that it’s always best to order the most expensive size when having pancit batil patong as it has the most complete ingredients that makes this northern dish what it is. Weng’s serving size was quite sufficient for the two of us, and that’s saying a lot considering my appetite. 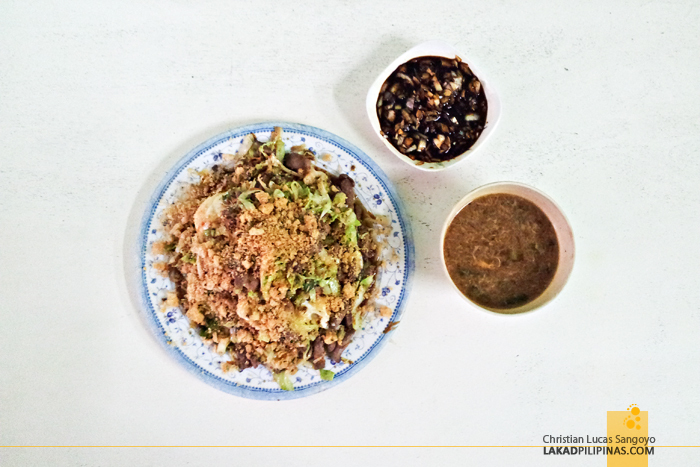 The carajay is made of crushed chicharon, there were hotdog tidbits similar to what we had at Ed’s Panciteria in Tuguegarao, it has carabeef meat and liver, the usual veggies were present, the egg was nicely poached, and the miki was said to have come straight from Cagayan. 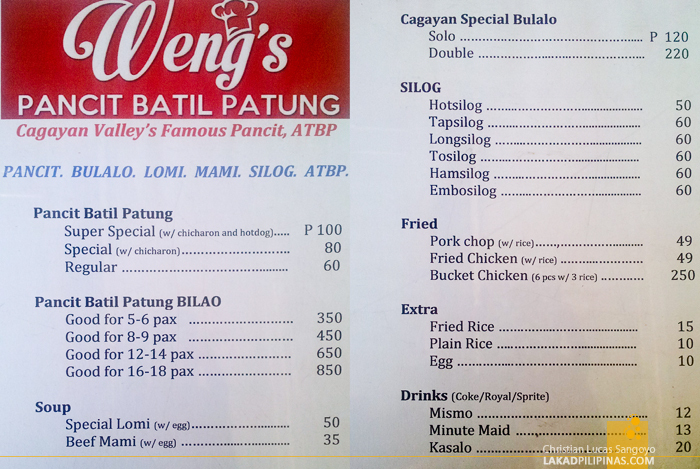 During the two times we ate at Weng’s we found the flavor to be consistent, albeit a bit too salty for my liking. I guess one can ask the cook to go easy on the salt if one wishes for a milder flavor. I also noticed that their servings are more saucy than is usual for this dish. 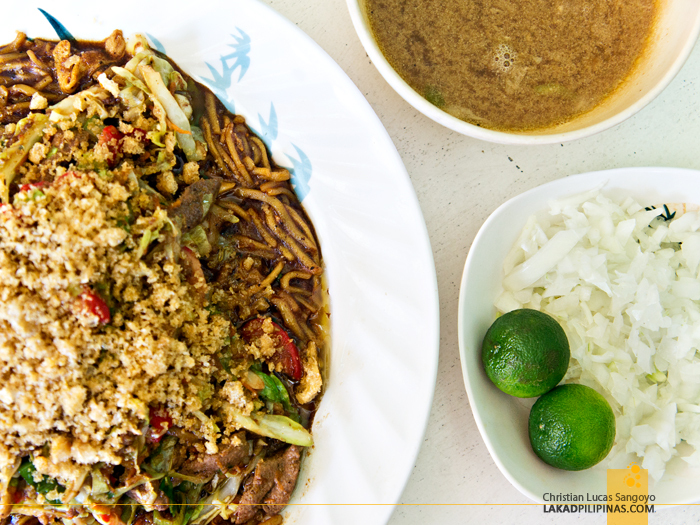 But all in all, Weng’s Pancit Batil Patung is a good enough alternative if you’re from Quezon City and you’re looking for a quick Cagayan noodle fix.